Do you ever find yourself looking at an apple and thinking: you’re too perfect to be a real apple, you look like the apple in Snow White? Or at a pineapple and thinking: should I eat you, or would Chiquita Banana be offended that I ruined her hat? This might be just me, I concede. But having gone this far in confessional, I’m just gonna come out and say it: I never eat a cherry without worrying that it might be prop food. Especially cherries that come in pairs. I had a pair of pair-of-cherry earrings, as it were, that I wore with my matching cherry print swing skirt to the Headlands Hotel disco when I was a child. And sometimes I would look at them in all their plastic glory and think: you’re too like cherries to be plastic. And I’d give them a little lick just to make sure. Cherries are fruit in a children’s book. Somehow too Hollywood to be true. Because I have just finished writing a romantic comedy – something of a cherry version of life, I suppose – we were talking about our favorites. Lots of votes for When Harry Met Sally. Lots of Votes for Bringing Up Baby. And I mentioned Crossing Delancy, a movie that I was a tiny bit obsessed with as a teenager, along with – odd mix – Heathers. If you don’t know it, it’s totally worth watching, and explores one of life’s most pressing conundrums: can a Great Grandmother persuade an Uptown Girl to find happiness with an Old Timey Pickle Seller? His Grandfather had a garment store on the Lower East Side, and every morning as he was opening up he would see this beautiful woman crossing Delancy Street on the way to the office where she was a bookkeeper. Every day, he’d watch her, and smile at her shyly, and eventually he plucked up courage to talk to her, and the rest is history. 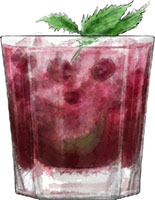 This is a Hollywood fantasy of a cocktail – it’s almost too deep vivid red to be real, too set-decorated with lime and mint to be true, and yet, happily, it is. This recipe is adapted from a New York Times 3 ingredient cocktail article, but since I have mint growing like a weed on the balcony, I took it more in a mojito direction by making a mint simple syrup and adding that to the base of the cocktail. This is a really useful blueprint recipe for all kinds of summer fruit variations – I’ve had recent successes with strawberries, passion fruit, and especially raspberries. 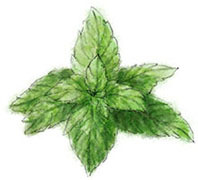 You can add this to regular mojitos, to frozen mint juleps – it’s a useful syrup to have in the fridge, and it will keep for a good month or so. This entry was posted in The Wednesday Tipple and tagged cherry, cocktail, cocktail party, crossing Delancy, drink, lime, mint, old time romance, party, romance, romantic comedy, rum, summer, writing. Bookmark the permalink. I know it’s been a while since I’ve commented, but just wanted to say, gosh I love your posts. This one especially tickled my fancy. Hollywood cherries indeed. Why thank you! So glad you’re enjoying what you’re reading!